On October 2nd, 2018, outspoken Saudi journalist Jamal Khashoggi was murdered at the Saudi embassy in Istanbul, prompting global outrage towards the Saudi government and the flagrant violation of human rights and of freedom of speech. 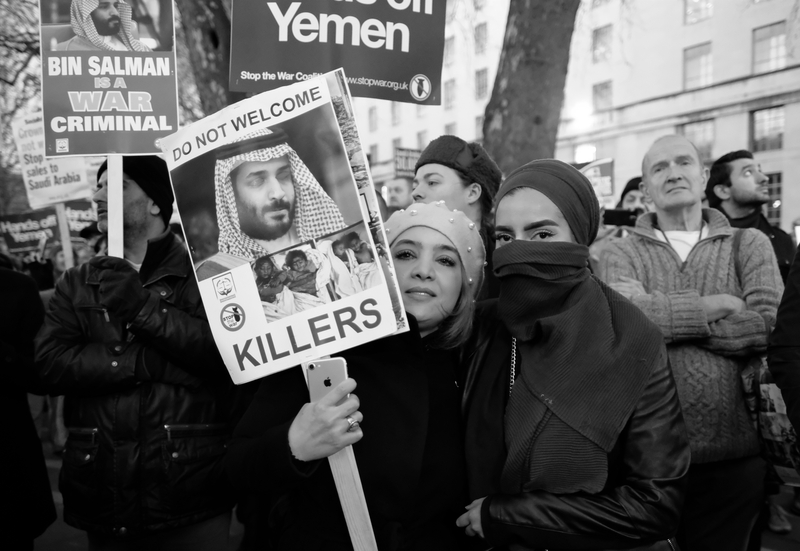 Khashoggi’s murder, highly condemned by governments and civilians alike, triggered the public to speak about other infractions committed by Saudi Arabia, including the long-ignored war in Yemen. The civil war in Yemen saw its beginnings in 2011, when revolts inspired by the Arab Spring forced the reigning president, Ali Abdullah Saleh, out of power. In 2015, Saudi Arabia became directly involved, organising a military coalition with several Arab countries and with support from the United States and the United Kingdom. Today, the civil war in Yemen has evolved into one of the most devastating humanitarian crises in history, with innumerable civilian deaths, widespread hunger and famine, and rampant disease. However, the civil war and humanitarian crisis in Yemen have largely been dismissed since Saudi intervention began. The high-visibility press surrounding the Khashoggi murder and the oversight of the crisis in Yemen perfectly encapsulate how the West and the international community define their relationship with Saudi Arabia: they are able to turn a blind eye to human rights violations for their own economic and geopolitical interests, and act only when the public demands it. The war in Yemen cannot be reduced to a conflict between two countries, Yemen and Saudi Arabia. Yemen, like many countries in the Middle East, sees its Muslim population divided into Sunni and Shia. The Muslim Yemeni population is split between 65% Sunnis and 35% Shia. The Houthi movement (who call themselves the “Popular Committees”) claims itself as the defender of the Zaina Shia minority and rebelled against the Saleh government throughout his presidency. After Saleh was ousted as president in 2011, the Houthi took advantage of the instability to steal control away from the Sunni in the Shia-majority north. However, with the Houthi representing the Shia minority, the Saudi government, with Mohammed bin Salman (MBS) as Defence Minister, claimed that they were an Iranian-backed militia, thus presenting a threat to Saudi Arabia and giving it the justification for a proxy-war with Iran. In 2015, Houthi soldiers advanced to seize control of the entire country. Thus, in March 2015, Saudi representatives announced the beginning of their “defence operations” against the Houthi. This move by Saudi Arabia fits into a history of trying to keep Yemen weak and divided. At the time, the Obama administration announced US support of the Saudi intervention in Yemen. The US and the UK, while not directly involved in the military coalition in Yemen, have been providing the Saudi military with intelligence information concerning Houthi and Iranian activities. While US support for Saudi Arabia’s efforts began under Obama, the Trump administration has since escalated it. Since 2015, 14 million people have faced starvation, in the worst famine the world has seen in 100 years; the country has also seen the largest modern outbreak of cholera. The tragedy of this crisis comes from the fact that it is man-made, purposefully worsened by Saudi military intervention. Instead of hurting the Houthi movement, Saudi intervention has motivated the minority to keep fighting, more determined than ever to beat their neighbour. How come the murder of one Saudi journalist prompted international outrage, yet the millions of Yemeni people threatened by famine and disease have not? The oversight of the humanitarian crisis in Yemen by the international community and by Western leaders fits into a history of complicity with Saudi Arabia despite their human rights violations. Symbolic moves were made by MBS to illustrate a “shift” in Saudi traditions, giving women the right to drive in 2015 and removing the Islamic police. These reforms by the now-Crown Prince have proven to simply be a distraction to commit other human rights violations, such as organising Khashoggi’s murder and sustaining the level of destruction in Yemen. 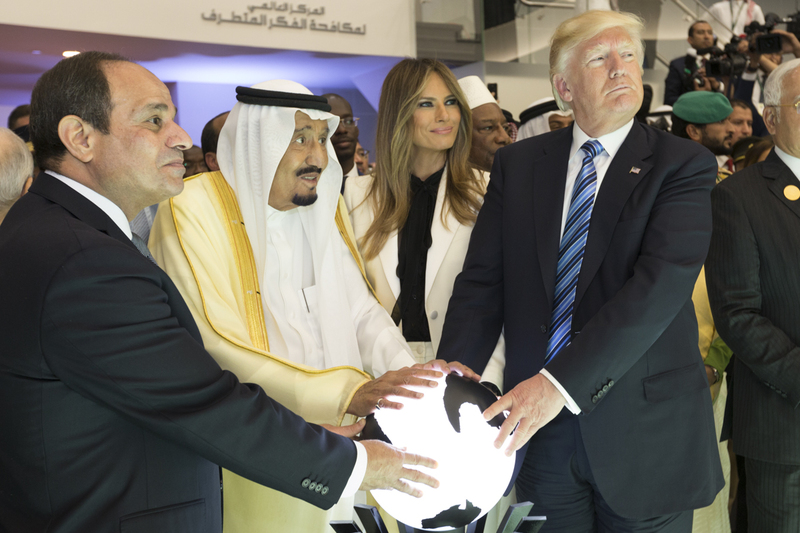 Trump, with First Lady Melania Trump, visited Saudi Arabia in 2017 in the midst of the crisis in Yemen. The West’s alliance with Saudi Arabia is usually simplified to the question of oil supply and prices. However, in the past years, this have proven more and more untrue. The US actually imports less oil from Saudi Arabia than it does from Canada – 0.96% compared to 4.05%. However, Saudi Arabia, amongst other OPEC countries, uses the threat of increased oil prices to dissuade Western countries from imposing any sort of economic sanctions on the country. Thus, the West, nervous to see a repeat of the oil shocks of the 1970s, try their best to maintain peaceful relations with the Kingdom. So while the West is no longer reliant on Saudi Arabia for its oil supply, it is still one of the largest and most influential players in the oil industry, representing 13% of worldwide oil production. Obama signing onto the Saudi “defence operation” against Houthi forces in 2015 after the approval of the Iran deal perfectly encapsulates the pressure felt by the West to not provoke the Saudi monarchy. Another common defence of the relationship between the West and Saudi Arabia is the necessity of arms deals and military contracts for Western countries and their economies. In 2017, in the midst of the war in Yemen, the Trump administration signed a $110 billion arms deal with Saudi King Salman. In August 2018, a Saudi air strike killed 44 children riding in a UN school bus and injured 79 more. It was later revealed that the bomb used was manufactured by the American company Lockheed Martin. Therefore, without the US even being a part of the military coalition against Houthi forces, the country is actively participating in the conflict. However, other Western countries also merit scrutiny for their arms sales to the Kingdom. In 2017, British arms sales to Saudi Arabia totalled a shocking $1.47 billion. It is worth noting that this sum only represents 1% of UK exports. This statistic delegitimizes the government’s claims about the inability to withdraw from these arms deals. From 2007 to 2018, the French government sold the country over $12.53 billion worth of arms. Finally, arms sales from Germany, the only country that ended arms sales to Saudi Arabia in October 2018, were valued at $332 million in 2017. However, Germany only ended arms sales to Saudi Arabia after the Khashoggi murder, and not the escalation of events in Yemen. Macron, on the other hand, stated that there is no reason France should stop arms deals to Saudi Arabia because the Khashoggi affair is completely unrelated. These figures illustrate, whether intentionally or not, that the priority of the West with Saudi Arabia is not the respect of human rights. 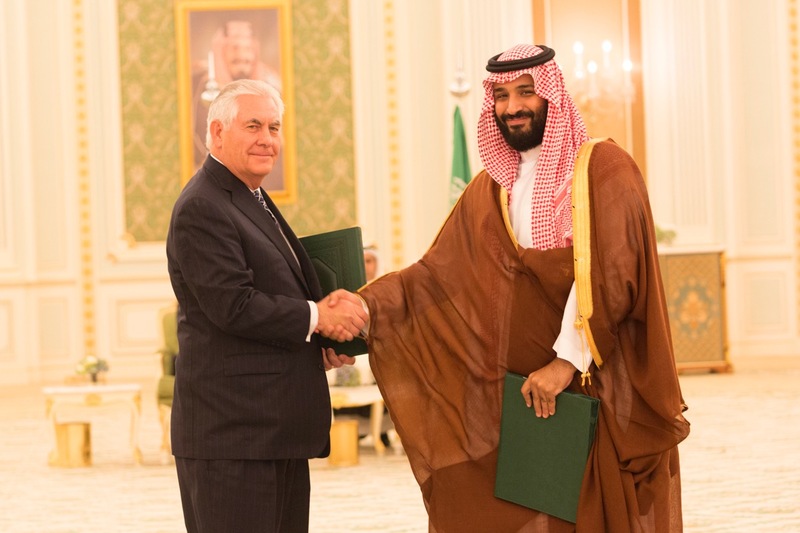 Former U.S. Secretary of State Rex Tillerson cozying up to (then-Deputy) Crown Prince Mohammad bin Salman (MBS) during Trump’s visit to Saudi Arabia in 2017. The West has more than proven its ability to ignore violations committed by the Saudi monarchy. However, the Khashoggi murder ignited larger-than-expected public furor and brought the crisis in Yemen back to the forefront of debates concerning Western alliances with Saudi Arabia. Democrats and Republicans alike, such as Bernie Sanders, Rand Paul, and Mike Lee, are asking for a new vote in Congress on American support for Saudi forces in Yemen. On October 30th, James Mattis made an unanticipated announcement demanding a ceasefire within the next month, just weeks after the Secretary of State Mike Pompeo declared the US’s continued support of Saudi efforts. For the first time since the beginning of the conflict in 2015, there is hope for the end of the war in Yemen. Until now, this has seemed unlikely, since expectations have been placed largely on the Houthi to stop the fighting. One can only hope that Khashoggi’s death served a larger purpose. His murder and cover-up have substantially affected public opinion towards MBS and the Saudi government. However, even if the war were to end, the damages incurred over the past three years will be nearly impossible to reverse. Anne is a U4 student currently studying International Development with minors in Hispanic Studies and Management. She specializes in North American and European politics as well as questions of social justice and issues surrounding the environment.